Medical device firm Cook Medical has expanded its EchoTip ProCore product line with the introduction of new EchoTip ProCore 20 gage needle with ReCoil Stylet. The new EchoTip ProCore 20 gage needle was developed to enable physicians to obtain histological samples from difficult anatomical locations. It can be used with an ultrasound endoscope for fine needle biopsy (FNB) of submucosal lesions, mediastinal masses, lymph nodes and intraperitoneal masses within or adjacent to the gastrointestinal tract. ReCoil Stylet’s automatic recoiling capability allows nurses and technicians to easily manage the stylet, helping to minimize the risk of contamination. According to the firm, the EchoTip ProCore product line is designed with a core-trap technology, which enables physicians to collect tissue samples during a minimally invasive procedure. Cook Medical endoscopy division global business unit leader Barry Slowey said: "The EchoTip ProCore 20 gage needle, developed with physician feedback, gives clinicians the flexibility to target small lesions while potentially increasing valuable histological yields." In September this year, Cook Medical obtained premarket approval from the US Food and Drug Administration (FDA) for its lower-profile Zenith Alpha Thoracic Endovascular Graft. Zenith Alpha Thoracic is indicated for the endovascular treatment of patients with isolated lesions of the descending thoracic aorta (not including dissections) having vascular anatomy suitable for endovascular repair. 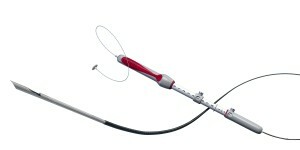 Image: EchoTip ProCore 20 gage needle with ReCoil Stylet. Photo: courtesy of COOK MEDICAL INC.